Last week I downloaded a free concert of works for piano and cello by Mendelssohn and Brahms from Vermont Public Radio. The “Beyond Beethoven” cycle of two cello sonatas by each post-Beethoven composer, performed by pianist David Kaplan and cellist Ben Capps, now lives on my laptop, where I will play it again as a reward for finishing this blog post. Whether you pay for online streaming services, such as Spotify, or order CDs by mail (a way of listening to music that seems to have found its last surviving market among classical fans), a free download is a free download. It’s easy to do, and you have until February 28. Go to vpr.net/apps/beyond-beethoven, and click on the tiny word “download” at the corner of each of the four pieces. If you miss the window to own them, you can listen to them online at VPR’s website. “Beyond Beethoven” is Kaplan and Capps' second free-download collaboration, following last year’s “The Beethoven Project.” For that, the duo played all five cello sonatas by the composer, who gifted the form with an equal balance among instrument parts. (Before Beethoven, what we now call “cello sonatas” were often piano pieces with a cello doubling the bass line.) Of that project, sonatas 2, 4 and 6 have been made available again for free download through April. This is all treat enough, but last Friday, VPR invited donors and media to a live concert by Kaplan and Capps, who played excerpts from and discussed the works they chose for “Beyond Beethoven.” VPR Classical host Joe Goetz, who produced the recordings, introduced the duo. The concert took place in the same intimate recording studio where the downloads were recorded, the space’s large red digital clock ticking away the microseconds. Kaplan and Capps were not paid for their work, and they won’t earn anything from it; it’s a gift. “There’s no real reason [i.e., motivation] for people to pay for music” anymore, Kaplan suggested in his opening remarks. Spoken like a 30-year-old habitué of the world of free downloads — legal and illegal. Except that musicians do have to be paid to survive; Kaplan and Capps were presented by Burlington Ensemble, sponsors of the concert they gave the next night. And what playing – augmented by the musicians’ deep knowledge of the pieces and their clear love of the music’s power, complexity and feeling. Kaplan talked about the grand gesture that is the “Brahms F” (Cello Sonata No.2 in F-major), and the orchestral scope and sound of it – as opposed to Brahms’ more careful, predecessor-aware first concerto. 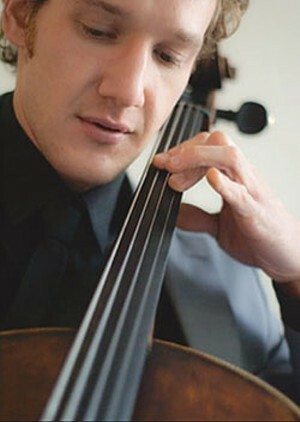 Capps countered his partner’s intellectual contextualizing by saying, “I want to talk about what I feel like when I play them, because that’s all I really think about.” Ironically, he said, he feels like an old man remembering his past during Brahms’ dark first cello sonata, in E-minor – which the composer wrote when he was young. “The second one is so much younger, but he wrote it much later,” Capps said. Before the pair played Mendelssohn’s Cello Sonata No. 2 in D-major, Capps isolated a semitic theme within it and explained that the composer’s father, though Jewish, converted the family to Lutheranism, a fact about which Mendelssohn remained ambivalent. The download page includes more commentary by the musicians on each piece. These are worth listening to before downloading the music – a kind of casual, conversational version of what audiences will hear NPR classical commentator Fred Child doing at the FlynnSpace concert on February 27 by the Johannes String Quartet. And now for that Mendelssohn.